Wizard of Oz Themed Costumes and Costume Accessories- Recreate the movie magic! With the recent release of 'Oz the Great and Powerful’ garnering record number of box office views (over $80 million in debut collections), the beloved fairy tale adventure has captured the nation's heart. Serving as a prequel to both the novel and movie (The Wizard of Oz), it has enthralled both children and adults alike. This return of 'The Great and Powerful Oz', accompanied with a slew of new characters has reignited an interest in everything 'Oz-related'! Children are enquiring about the original movie and its iconic characters such as Dorothy and the Wicked Witch. It is exactly in such a climate that a Wizard of Oz themed birthday party would be a fantastic idea. Dorothy, Glinda the good witch, Tin Man, Scarecrow, the Cowardly Lion and the Wicked Witch, all are movie characters that make for great costumes. Go for any of the aforementioned character costumes and accessorize with the right accessories and voila, you are ready for a Wizard of Oz theme party. From infants and toddlers to fully-grown men and women, there are costumes and accessories available for everyone. That said, lets start by taking a look at the Adult Costumes. Planning a Wizard of Oz theme party, then the right set of costumes is a must have. For women, the most popular and favorite choice is by no surprise, Dorothy. The plucky little girl who never ceased to amaze everyone with her determination and courage is an iconic character. Women can also opt to go dressed as the Wicked Witch. For the menfolk, the Tin Man is a popular choice. 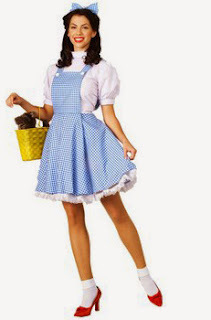 Realize your childhood dreams and become Dorothy, simply by donning this Wizard of Oz Dorothy Costume. It includes a dress with an attached blouse and two hair bows. If Dorothy happens to be too sugary for your taste, then why not go for something more sinister and dark? The Wicked Witch was feared by all the people of Oz and this has always made her a fascinating character. 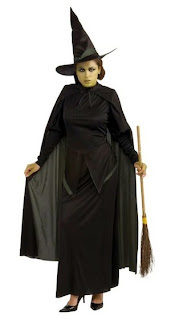 The costume includes a full-length black polyester dress and cape trimmed in shades of green with jagged edges, and matching hat. Now that we're done with the ladies, it is the turn of the menfolk. 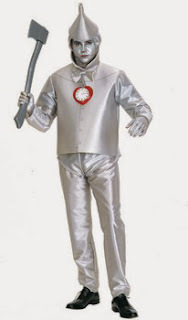 Tin Man, the lovable man made out of tin who is looking for a heart of his own has always been a favorite. This costume includes a silver jumpsuit with matching funnel headpiece. Costume accessories add that special touch to good costumes and help to make them extraordinary. For a Wizard of Oz theme party, you can go for masks and wigs to make your costume look more authentic. Dorothy or rather Judy Garland who portrayed her, looked so cute with her two pigtails that the style became a hot favorite among teenagers and adults of the time. 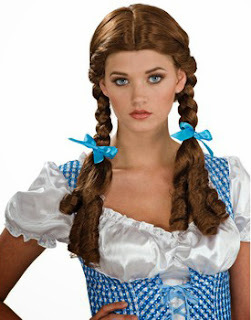 Now, you too can also have the famous hairstyle with this wig that will complete your transformation into Dorothy! 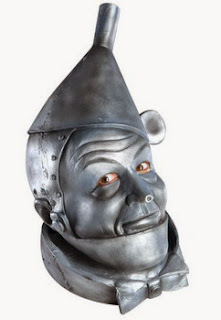 Complete the look with this authentic mask that will definitely transform you into the lovable Tin Man. Perhaps more than adults, Wizard of Oz theme costumes definitely excite the kids. When planning a birthday or a simple costume party for them, make sure to go for costumes that they recognize and more importantly like. The Cowardly Lion, Glinda the good witch and of course Dorothy are all liked by children. 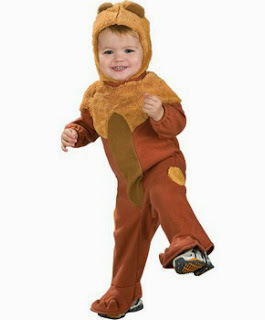 You can find costumes for all age ranges, right from infants to toddlers and children. The Cowardly Lion who wanted courage for himself and was truly courageous as he helped Dorothy in her mission; always a good choice for the party. This infant costume includes a romper and headpiece. Why not both mother and daughter dress up as Dorothy for a Wizard of Oz theme party? Little girls love their mothers and what better way to show your love than by matching costumes! This Toddler Costume includes a dress, hair bows and plush toto monkey accessory. 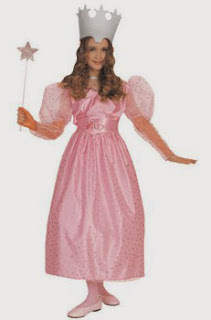 Who can forget Glinda the Good Witch who helps Dorothy on her quest, every step of the way? A good sorceress, Glinda is a favorite among the girls. This costume includes a dress, headpiece and belt. Why should the girls have all the fun? 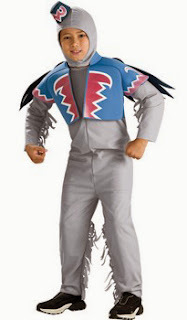 Little boys love monkeys and they will definitely love this Flying Monkey Costume. It includes a jumpsuit with hood. Costume accessories are not just meant for adults, even kids can use a nice pair of shoes or a mask to help make their costumes look more authentic. The fabled ruby slippers worn by Dorothy serve as a must-have addition to the costume and your daughter will love you for getting her these. 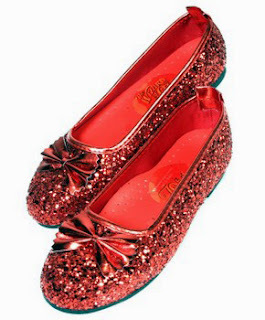 A pair of ruby red glitter shoes will look great with the Dorothy costume that your little girl would be wearing. These ruby slippers come with attached red bows. 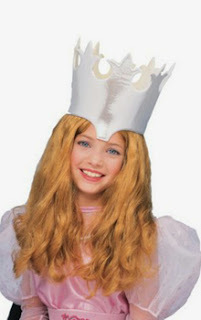 If your little girl is dressing up as Glinda the Good Witch, she will need a good wig to complete the look. This golden color wig will make her truly feel like the beloved enchantress. With all this info in hand, it should be a cinch to plan your own Wizard of Oz theme party. Remember to choose the right costumes and costume accessories and you should be fine. Wishing you luck in your party endeavors!